The streaming mode feature allows you to configure AirPlay buffer size. Higher buffer size results in higher latency and reliability, while lower buffer size results in lower latency and reliability. Actual latency is approximately 200 milliseconds higher than the AirPlay buffer size. Note: This feature doesn’t work with software based on ShairPort such as ShairPort4w, XBMC, AirPi, RaspyFi etc. They receive audio with a fixed buffer size of two seconds. TuneAero supports timing and syncronization, and is compatible with Streaming Modes. TuneBlade provides three streaming mode presets and an option to specify arbitrary buffer size. RealTime Streaming Mode Preset: Lowest possible buffer size. Normal Streaming Mode Preset: 2 seconds of buffering. Buffered Streaming Mode Preset: 3 seconds of buffering. Custom Streaming Mode: Select arbitrary buffer size. In this mode, TuneBlade streams at a buffer size of 2 seconds. This is the default setting. In this mode, TuneBlade streams at a buffer size of 3 seconds. Due to a larger buffer size, this mode results in a much reliable stream, but with higher latency. In this mode, you can select an arbitrary buffer value for streaming. This is useful especially when the RealTime streaming mode is unreliable, and you don’t wish to increase the buffer to 2 seconds in Normal Streaming Mode; instead you can manually configure the buffer size in this mode. This mode is also useful to go beyond the 3 seconds buffer size of Buffered streaming mode for certain receivers capable of handling larger buffers. Select ‘AirPlay Streaming’. Select the desired streaming mode. 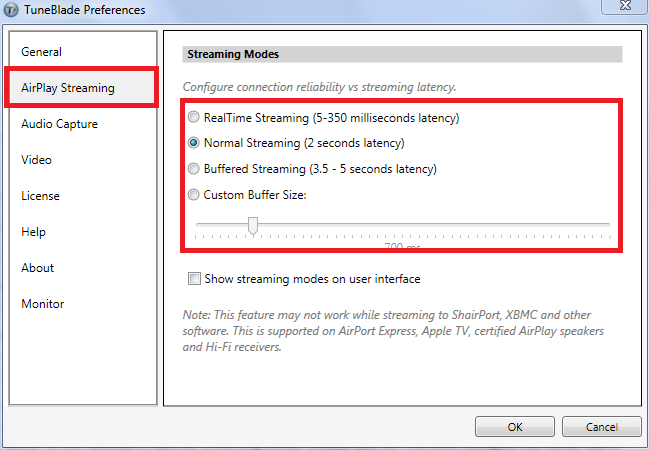 If you are selecting “Custom Streaming Mode”, select the buffer size using the slider.